Gilas Pilipinas will face China in their second game in the Men's Basketball Tournament of the 2018 Asian Games. The Philippines men's national basketball team will try to make it two wins in a row after an impressive 37-point win over Kazakhstan last week. Jordan Clarkson is set to debut for Gilas Pilipinas against powerhouse China, who feature two NBA players Zhou Qi and Ding Yanyuan. The Philippines hopes for a win and a top finish in Group D to avoid a possible quarterfinals collision with South Korea, who will most likely top the Group A. 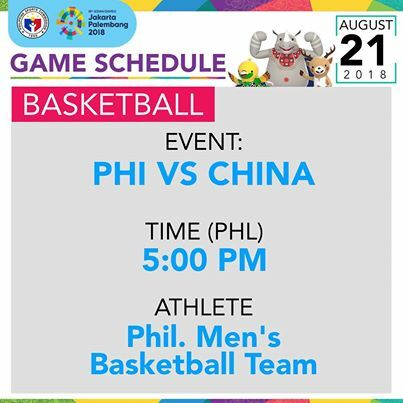 Here are the details for Philippines-Gilas Pilipinas vs. China in the Preliminary Round of the 2018 Asian Games Men's Basketball Tournament. CHINA 82 – Zhou 25, Wang 13, Abdurexiti 12, Zhao 11, Ding 7, Sun 6, Liu 5, Fang 2, Dong 1. PHILIPPINES 80 – Clarkson 28, Standhardinger 18, Pringle 14, Lee 10, Erram 6, Almazan 2, Belga 2, Norwood 0, Ahanmisi 0, Yap 0, Taulava 0.